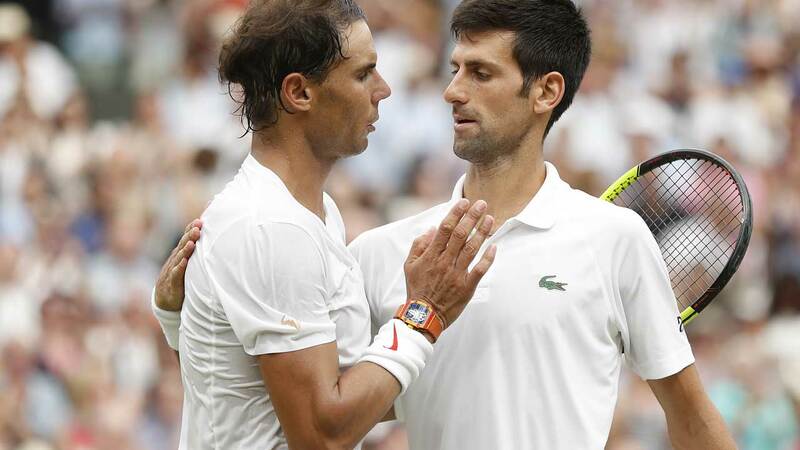 Novak Djokovic reached his fifth Wimbledon final on Saturday with a 6-4, 3-6, 7-6 (11/9), 3-6, 10-8 victory over Rafael Nadal in the second longest semi-final ever played at the tournament. Djokovic, the 2011, 2014 and 2015 champion, will face Kevin Anderson, the first South African in the final in 97 years, for the title after a 5-hour 15-minute marathon.Victory on Sunday for the 31-year-old Serb would take his career Slam tally to 13, four behind Nadal but still seven back from Roger Federer. It was a second day of epic drama at the All England Club after Anderson had needed 6 hours and 36 minutes to beat John Isner on Friday.That set the record for the longest semi-final at the tournament and became the second longest Grand Slam singles match ever played. It also meant that Djokovic and Nadal had been unable to finish their 52nd career clash on Friday night. The Saturday drama delayed the start of the women’s final between Serena Williams and Angelique Kerber. “It’s hard to pick the words. I’m just going through things, flashbacks to the last 15 months, everything I’ve been through to get here,” said world number 21 Djokovic, the lowest ranked finalist in 15 years. “To win against the best player in the world, in one of the longest matches I ever played, I’m just overwhelmed. Djokovic finished with 23 aces and 73 winners and triumphed despite only converting four of 19 break points. “Until the last shot I didn’t know if I would win. These are matches you live for and work for,” he added. Former world number one Djokovic will take a 5-1 career lead over eight-seed Anderson into the final. The South African won his only match against the Serb in 2008 while Djokovic has beaten him twice at Wimbledon. “Hopefully we can first of all play!” an exhausted Djokovic said of his fellow marathon man. Anderson, who knocked out Federer in the quarter-finals, has been on court for 21 hours at the tournament. “He had a day off which means a lot. I wish I could have one, but it is what it is,” Djokovic said. Djokovic had been in control on Friday, leading two sets to one when the match was halted due the 11pm (2200GMT) curfew. Play in their 52nd career meeting resumed under the roof on Saturday despite bright blue skies and temperatures pushing 30 degrees. Djokovic, the 12th seed, could not convert two break points in a 15-minute opening game of the fourth set. In front of the watching Catherine, Duchess of Cambridge, and Meghan, Duchess of Sussex, Nadal made him pay. The sweat-soaked two-time champion held, broke and held again for 3-0.However, back roared Djokovic with a break and was soon back on level terms at 3-3. In a roller-coaster of a set, Nadal broke for 5-3 causing Djokovic to angrily smash his racquet into his feet four times.He was even angrier minutes later when he squandered three more break points to allow Nadal to level the semi-final with an ace. Djokovic wasted another three break points in the eighth game of the decider. Nadal then squandered three break points in the 15th game before saving a match point in the 16th with a pitch-perfect drop shot.However, the pressure of serving second was relentless and Djokovic wrapped up victory in the 18th game when Nadal speared a forehand wide.